The UK has numerous watery iconic landmarks and natural phenomena all begging further investigation by stand up paddle board. Once such location is the Isle of Wight’s westward cliffy outcrop otherwise known as The Needles. Awe inspiring, breath taking and vast The Needles lighthouse is surrounded by treacherous water and exposed to the full brunt of Mother Nature. Simon Winkley, Starboard UK SUP ambassador, was up to the challenge, however. ‘The Needles are three vertical hard-chalk rocks which form a magnificent spine jutting out into the sea at the western-most point of the Isle of Wight. Add to the scene a 33m tall, candy-striped, red and white 19th Century lighthouse and the location can only be described as iconic. This is where some serious gusts of wind have been measured over the years during ferocious storms and isn’t a venue to be approached in blasé manner. On the first day of December, 2016, a high pressure system over the south of England brought with it zero wind. Magic Seaweed confirmed that everywhere would be totally flat and swell-less. 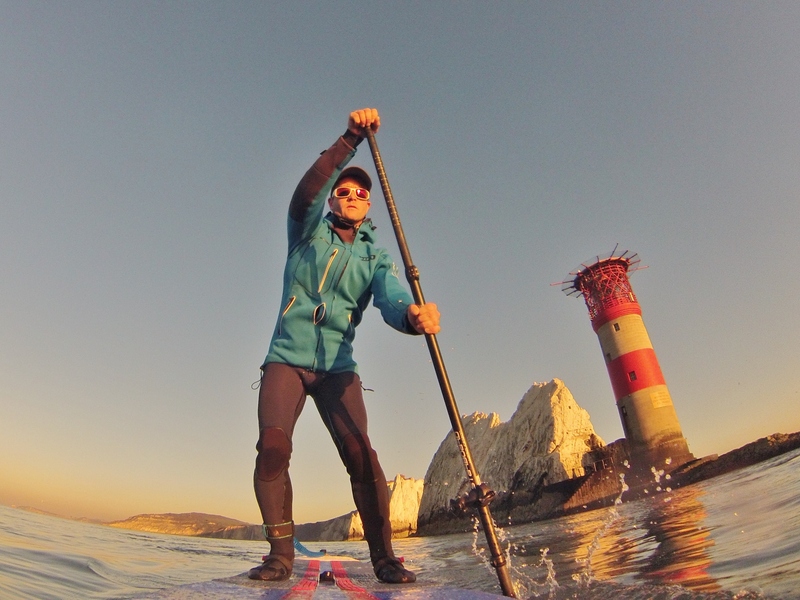 Add to that a sky devoid of a single cloud and everything looked perfect for a quick solo paddle around The Needles. I parked at The Needles Attraction and, using the rucksack for my inflatable Starboard Racer 12’6 x 28, carried it easily down the vertical and numerous steps to Alum Bay Beach where the chairlift takes tourists in the summer. I was aiming for a sunset paddle and, after a few minutes of pumping up the board, set out mid-afternoon on mirror-like water. The light from the low sun was boosting the appearance of the multi-coloured sandy cliffs and everything was very serene and calming. As it was so cold I opted for a full O’Neill winter wetsuit and Ion Neo-Shelter Jacket just in case I ended up in the water. That’s not my normal choice for a paddle but both garments are super-flexible, easy to paddle in and gave a little peace of mind. As I rounded the lighthouse, The Needles looked incredible with the milky light enhancing everything – this time of year can offer up amazing colours. The water either side had some flow in it but not too much. Outside in contrast was pretty swirly and difficult to read. The glide, speed and directional stability of the 12’6, however, was able to slice through the eddying water as I paddled. It was awesome to be in that place with no one else around as the sun dropped below the horizon. I say no one – at one stage a fishing boat came close by to check that I was OK. It was good to know that another vessel had taken the time to look out for a paddler, but other than that I was solo.